New technologies, big data, and access to candidate information are revolutionizing the recruiting world. Now that recruiters finally have access to the same types of information as marketers, it’s becoming clear that recruiting is marketing. 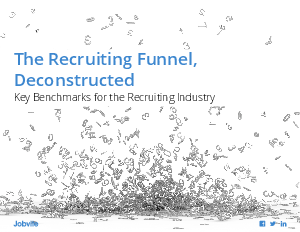 Read Jobvite's eBook “The Recruiting Funnel Deconstructed” to learn key benchmarks for the recruiting industry.